Well I think I’ve probably done this one before a while ago, but as I’ve said before, I love these things. Thanks to Jo from A Rose Tinted World and Emma from Emma and the girlsfor tagging me in this Random Facts About Me Blogger Q&A. I love finding out about other bloggers, what similarities there are, what differences. It’s such a good way of getting to know others. I’d like to think so. I have a filthy mind, a wicked sense of humour, I like to laugh, I like to make my friends happy, I’m loyal. But you do have to forgive me that I can be useless at replying to messages, but I do get there eventually! Their eyes. I love people’s eyes. It might sound a bit weird that. But you can tell so much from someone’s eyes. Happy endings. I’m not a big fan of scary movies, I think I’m probably a bit too much of a wuss to enjoy them. But I do love a happy ending. It just gives you such a warm feeling. What’s the furthest you’ve ever been away from home? Malawi. I can’t believe it is just over 13 years since I was last there! Life has changed a lot since then. I really do wish I could go back one day. I have so so many fantastic memories of there. Leeds, in the best county in the country! I love spending time on my allotment/in the garden. I love watching films and reading books, although rarely have time for either of them these days. I love spending time with friends and family. And I love trying out new crafts. I’m going for somewhere around 21-22. Lunch in Zimbabwe, a stop-over in The Netherlands and Kenya, and a wee in Mozambique totally count don’t they!? What was your favourite/ worst subject at school? Favourite was probably history. I always loved it, fascinated by pretty much it all, particularly WW1&2. I absolutely detested Maths though. Just did not like it, guess I had some crappy teachers which did not help. Caramel Macchiato, or a gin& tonic/mojito. So far we just have Isla Jean. My gorgeous girly. Her first name is from Islay, the island in the Inner Hebrides, and her middle name was my Grandma‘s name. Chris never played along with “what shall we call our children”, even when we were expecting Isla. He never really came up with many names, just ones he didn’t like. For a boy I’ve always loved Matthew Alexander…but Chris has vetoed that one already for various reasons! We shall see what names we come up with if we ever have another child. I love watching Charlotte Louise Taylor, her daughter is a couple of weeks older than Isla, and I’ve followed Charlotte since I was first pregnant with Isla. And I also love brummymummyof2, she is an absolute fruit loop, but in a good way! Only one that really matters! Running up and down the hay bales in France, near “Hazel’s Cottage”. On one occasion we had to jump down quickly and hide as the farmer was coming. I have no idea whether it was true, and whether we did actually have to hide, or whether Dad was just winding us up, but it was fun all the same. Procrastination! I am awful at putting things off til the last-minute. I am a master of procrastinating, and could probably turn it into an art form! 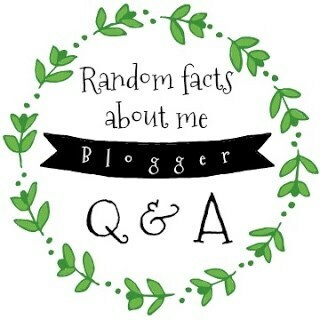 So those are my Random Facts About Me blogger Q&A. Can’t wait to see all your answers!